Some germy places in the house include the kitchen faucet and sponges. Typically people wash their hands after handling raw meat in the kitchen and frequently use sponges or cloths to wipe germs from surfaces in the kitchen. (photo: pixabay). Scientists have long thrown shade at the unassuming kitchen sponge. The household staple skulks in sinks amid dirty dishes and soggy food scraps, sopping up and amplifying microbial forces capable of invading clean food spaces. The savvy kitchen-goer may think they have this situation locked down—a simple toss through a sanitizing dishwasher cycle or a sizzling swirl in the microwave… and done. Sudsy germsplosion averted. In a comprehensive study of 14 household sponges and their microbial inhabitants published in Scientific Reports, researchers confirmed that kitchen sponges are indeed domestic abominations. Moreover, any sterilizing attempts only seem to temporarily free up sponge-space for potential pathogens, which rapidly recolonize the festering scrubber. 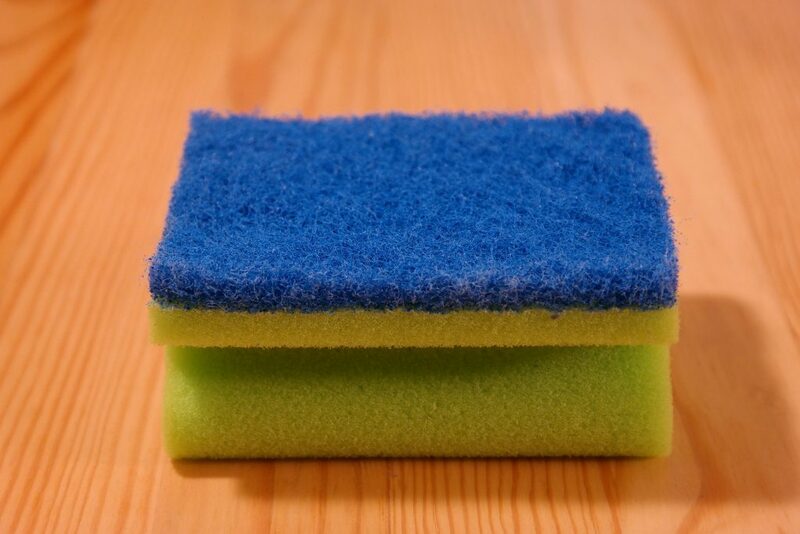 From a long-term perspective, sponge sanitation methods appear not sufficient to effectively reduce the bacterial load in kitchen sponges and might even increase the shares of [disease-linked] bacteria… We therefore rather suggest a regular (and easily affordable) replacement of kitchen sponges, for example, on a weekly basis. Now, the researchers haven’t soaked up all possible data points of sponge science. But their study offers the most comprehensive look yet at the nasty sink-dwellers. Taking top and bottom samples from 14 household sponges used in Germany, the researchers extracted genetic material to sequence and identify microbial inhabitants. They also used a method to tag active, breeding microbes with fluorescent markers and visualize them in the sponge material using 3D confocal laser-scanning microscopy. The sequencing harvested more than 220,000 raw DNA sequences, which represented 9 phyla, 17 classes, 35 orders, 73 families, and 118 genera of microbes. As other, smaller studies reported, the researchers found that bacteria in the family Moraxellaceae dominated sponge space, accounting for about 36 percent of microbes in samples. These germs are typical on human skin and have been found all over kitchen surfaces that tend to be cleaned with sponges—counters, fridge shelves, faucets, and stoves. They’re also found on dirty laundry and are known to give clothes a stinky smell. Otherwise, the researchers found Proteobacteria, Bacteroidetes, and Actinobacteria were primary phyla. Five of the 10 most common operational taxonomic units—basically like species—were closely related to bacteria associated with moderate diseases. In terms of concentration, previous studies had pegged sponge germ density around 107–109bacterial colony forming units per sponge. Assuming that only about one to three percent of bacteria can be grown in labs into colonies, those estimates match the new data. Egert and his colleagues found densities as high as 2.5 x 1010 and 5.4 x 1010—that’s 25 to 54 billion—bacterial cells per cubic centimeter of sponge. 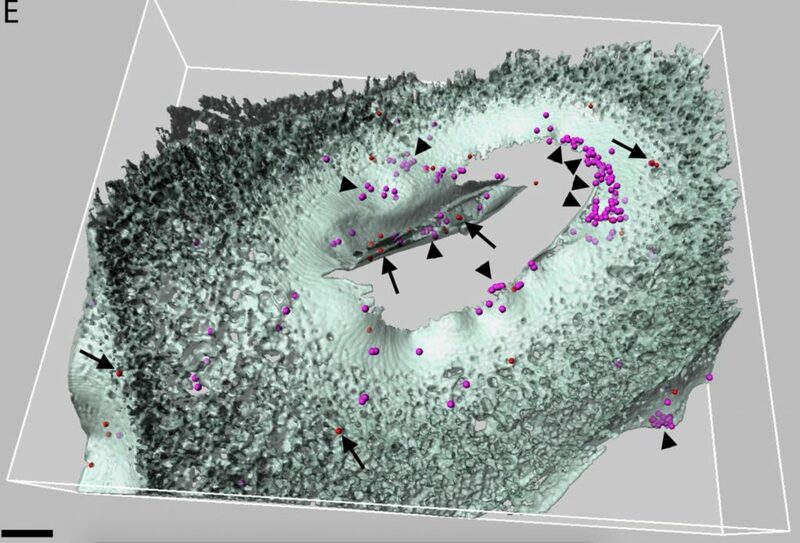 The 3D visualizations showed ubiquitous distribution of microbes throughout the sponge, with dense biofilm-like structures on the sponge surface. The researchers noted that a few of the sponge owners had said that they cleaned them regularly, either by microwaving or using hot-soapy washes. Those sponges didn’t have fewer microbes than the others, but they did tend to have more bacteria related to those that are linked to disease. (A) Kitchen sponges, due to their porous nature (evident under the binocular (B) and water soaking capacity, represent ideal incubators for micro-organisms. Scalbar (B): 1mm. 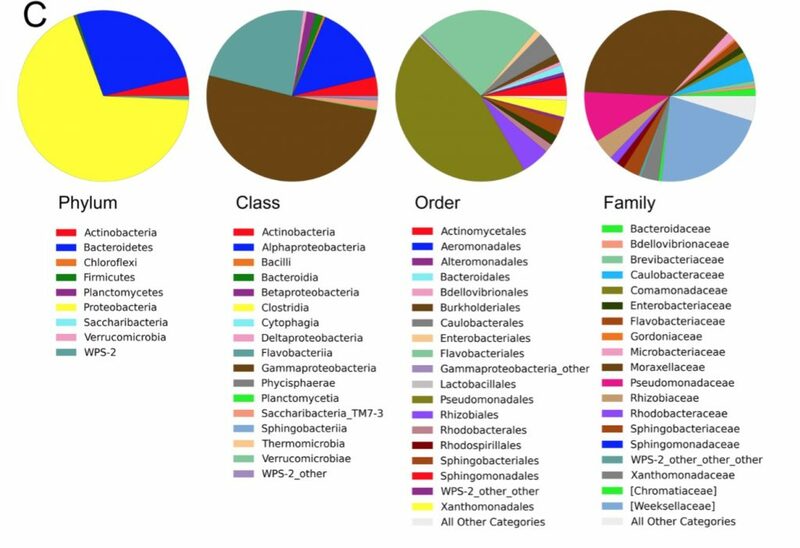 Pie charts showing the taxonomic composition of the bacterial kitchen sponge microbiome, as delivered by pyrosequencing of 16S rRNA gene libraries of 28 sponge samples (top and bottom samples of 14 sponges, respectively). For better readability, only the 20 most abundant orders and families are listed. 3D model of the bacteria in the sponge sample 6b. Volume–renderings of a confocal stack showing sponge auto fluorescence (cyan); Gam42a–stained bacteria (blue) and EUB338MIX–stained bacteria (red); where Gammaproteobacteria appear purple for the overlap of red and blue, while other bacteria remain only red. Analysis of bacteria in sponge sample 9b. 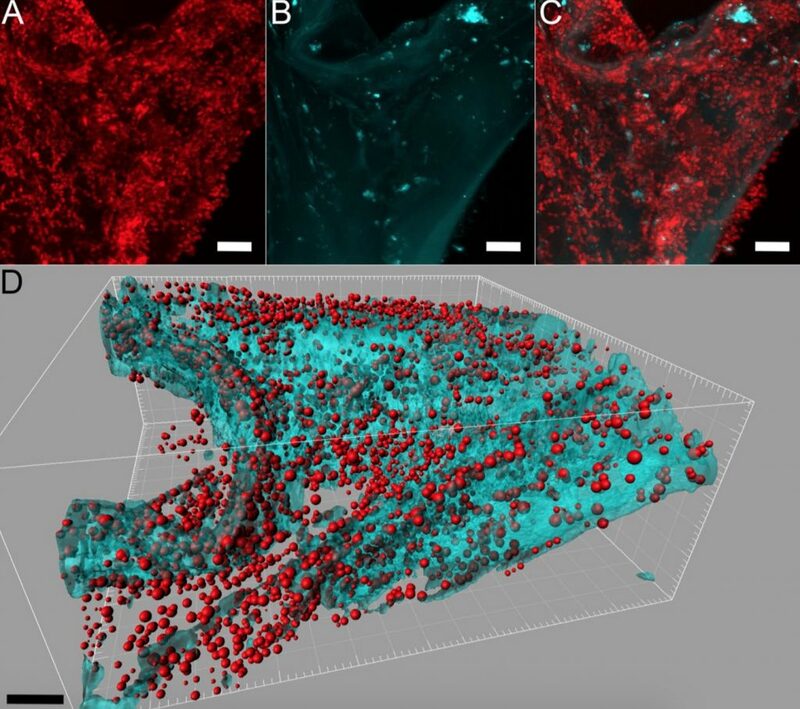 Maximum projections of confocal stacks, showing EUB338MIX–stained bacteria in red (A) and sponge auto fluorescence in cyan (B); (C) is the overlap; and (D) is the 3D model. Scientific Reports, 2017. DOI: 10.1038/s41598-017-06055-9 (About DOIs). Een keukensponsje schoonmaken, dat doe je door het in kokend water te steken. En als je een fan bent van lifehacks, heb je er misschien al eens eentje in de microgolfoven gestoken. Maar volgens een nieuwe studie is dat niet voldoende om alle bacteriën te vernietigen. Sponsjes in je keuken zijn een broeihaard van bacteriën en zelfs regelmatig schoonmaken kan dat niet verhelpen. Dat is de conclusie van een team wetenschappers, die een analyse maakte van de bacteriën op sponsjes, ook diegene die schoongemaakt werden. “Onze data suggereren dat sponsjes die volgens hun gebruikers regelmatig schoongemaakt werden, niet minder bacteriën bevatten dan de ‘vuile’ sponsjes”, staat in de studie, gepubliceerd op het online wetenschapskanaal Scientific Reports.